I remember the years when I was a teenager, we lived close to the church and my parents would often invite company home for lunch. My mom usually had a pot of soup ready and quickly made Rollkuchen to go along with the soup. It was pretty much the same, Sunday after Sunday, but she never stressed and everyone loved the meal. This recipe yields about 24 meatpockets or regular Rollkuchen ... you may want to double it. In a small bowl, mix eggs with fork and then mix in the rest of the wet ingredients. In another larger bowl, mix flour, salt and baking powder, make a well and add the wet ingredients. Stir with wooden spoon, adding in the dry, until all ingredients are mixed well. Dust with flour and knead slightly jsut to gather and smooth. Add flour as needed so it is not sticky. (Can be wrapped and refrigerated at this time to roll and fry later.) Roll out quite thin on floured board or counter. Place a rounded teaspoon of filling about one to one and half inches apart in a row, along one end. Heat oil – test with a little dough to make sure it fries quickly, or throw in a few kernels of popcorn. Oil is ready when they pop. The trick to not have deep fried food soak up too much oil is to fry quickly in very hot fat. A cast iron works great. Use 2 forks or tongs and have a paper towel lined pan ready. but He says "Be still"
to the one He holds in His hand. "I have covered you with the shadow of My hand"
like the calming voice of a mother to her crying child, held close to her breast. that is the place that is ours, in the hollow of His hand. Are you overwelmed with busy-ness? speaking peace to you alone. "Father, I pray for every person, whose eyes fall on these words that you would speak to their hearts these words of peace. May they know that you alone are God, that you alone can calm the troubled seas . May they know the security of your loving Hand today. Amen"
In the carefree summertime it's good to have a few no pressure, no fussing meals to fall back on. This simple meal takes less then 20 minutes to prepare and can be served up with a simple green salad and some bread. Here's my carefree pasta meal. Cook 12 ounces of pasta of your choice in salted water to al dente and drain. Add a jar of Spaghetti Sauce or your favorite sauce to the noodles. Add the cooked ground chicken or turkey. Add fresh chopped tomatoes and chopped green onion. Cook all ingredients together until sufficiently heated through. Season to taste and serve with garlic bread. The tomatoes are ripe and there is fresh basil in abundance. What could be better for lunch than bruschetta...with fresh garden ingredients? I'll give you my basic recipe, which can be changed up a little to suit your taste. Pre-heat oven at broiler setting. Combine tomatoes, olive oil, garlic, salt and pepper...and allow to sit at room temperature for about 10 minutes. Cut baguette in 3/4" slices and arrange in single layer on a parchment lined baking sheet. Lightly brush with olive oil...and toast lightly under broiler for 1 or 2 minutes. Repeat toasting with the other side. Put a generous layer of chopped basil on each piece of bread. Top each piece with a generous amount of shredded mozzarella cheese. Return to the broiler for about 5 minutes or until cheese is melted, bubbling and slightly golden. Serve hot out of the oven...for a wonderful appetizer...or add a salad and call it lunch. This is the season when Zucchini's are offered by neighbors or are easily affordable. I have been making this recipe since I was married 31 years ago. I got it from my mom by love Pauline. It is easy and quick and never fails. It stores well and can be frozen. 2 cups fresh walnuts. .very coarsely chopped I like the walnuts left big. . but you can chop them fine. You can also leave them out or subsitute with another nut of your choice. 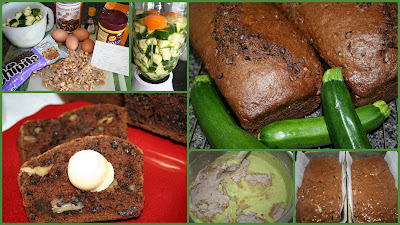 Put the zucchini cubes, eggs, and oil in the blender. Blend on high speed until smooth. Add the zucchini mixture and stir with a wooden spoon. Add the chocolate chips and walnuts. Pour into a greased tube pan or two 9 X 5 loaf pans. Bake for 60 - 75 minutes. Test with toothpick. I don't know how many of you will know what this is, but it is a Mennonite side dish (with, I'm sure, Ukrainian influence) that was/is a favorite of my husband. 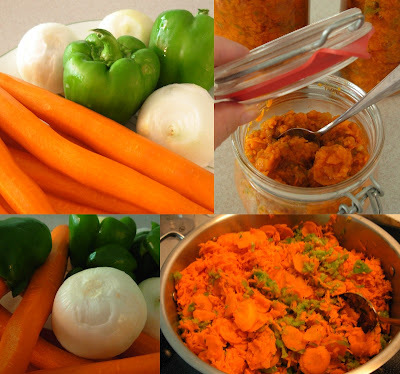 It is not unlike Salsa, maybe, but it is made with carrots as the main ingredient. Cook for 20 minutes to 1/2 hour . Remove from heat , and ladle into prepared canning jars or store in fridge for immediate use. What is a tea without Scones and Devonshire Cream? Devonshire Cream can be purchased in the grocery store near the cream cheese. If you can't find Devonshire Cream, you can substitute 2 parts whipping cream with one part mascarpone cheese and a tablespoon of sugar. 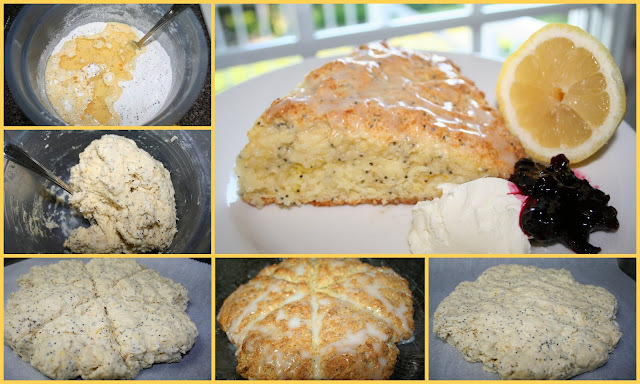 This scone recipe is easy to prepare because the recipe does not require butter to be cut into the flour. The recipe takes under 10 minutes to have ready for the oven. Combine all the wet ingredients in a medium sized bowl, egg first and whisking it until light. Add the poppy seeds and the lemon rind to the dry ingredients. Make a well in the dry ingredients and pour in all the wet ingredients. Transfer the dough onto a greased or parchment lined cookie sheet, patting it into an eight-inch circle. Cut the circle into 6 pieces but don't move the dough to separate. Bake about 15 minutes or until lightly browned. Break the scones apart. Serve with Glaze, Creme Fraiche, Devonshire Cream, assorted jellies or Lemon Cheese. Combine the juice from the 1/2 lemon with enough icing sugar to make a thin pourable glaze. Pour over the scones while still warm. I received this recipe from a neighbor of mine many years ago. 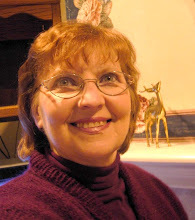 Just recently she called me and could not believe that her Mom, Florence's carrot cake recipe was on our blog post. It's fall time, and on this beautiful day, you can hear the tractors and machinery tilling up the land, planting winter wheat. What better treat than to serve a fresh piece of moist carrot cake loaded with almonds and a fresh cup of coffee. We don't know how long the weather will last. Follow normal cake making directions. Mix sugar, oil, and eggs. Add vanilla and the combined dry ingredients and nuts. Add the carrots to the batter and stir well. Bake in a well greased 9 x 13 pan at 350 F for 45 minutes. Soften butter, add cream cheese and blend until smooth. Add powdered sugar and spread on cake when cool. Sprinkle chopped almonds on top. This cake becomes better with age and freezes so well. This cake will be going along on a road trip to visit family for Thanksgiving weekend. 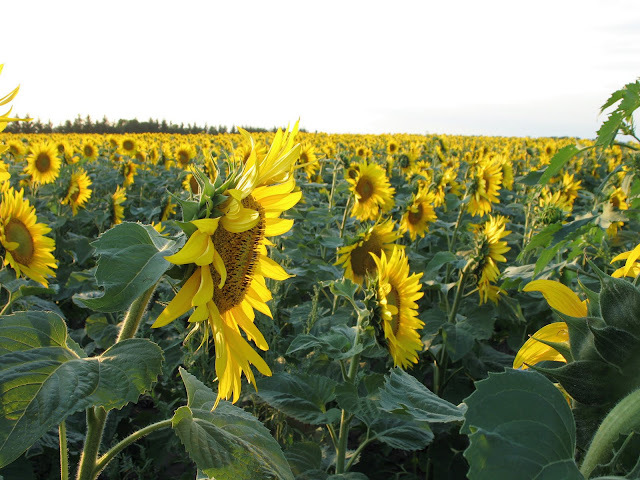 Is there anything quite as striking as a field of sunflowers in bloom? There are many flowers that turn their faces towards the sun. The sunflower turns to face the sun completely leaves and all. There's a lesson here for each of us. Are we seeking after God completely? This side dish may seem a little fussy, but it is a great way to do potatoes for company ahead of time. You can prepare them and have them ready to pop in the oven 20 minutes before a meal. I like it when you have nothing to do at the end. This recipe, with some minor changes, was submitted by Kimberly F. to our church cookbook. It's one that I have found works well. When potatoes are cool enough to handle, cut a thin lid from top of each. Scoop out pulp, leaving 1/4 inch or so in the shell, so it doesn't tear. Combine pulp with remaining ingredients, mashing to desired consistency. Scoop mashed potato mixture back into skins. Arrange on baking sheet. Refrigerate until half hour before the meal. Bake at 350º F about 20 - 25 minutes, until tops are golden. Zucchini. Again! There seems to be no end to the zucchini coming from the garden and here is another simple yet delicious way to cook it. When I got my first microwave oven (way back when) I took some microwave cooking classes. Since that time, this zucchini recipe has been a summer favorite. Cooked totally in the microwave, the kitchen stays cool. Add some fresh tomatoes and maybe a cob of corn...and call it a meal. Place zucchini and onion slices in an 8" square dish...or a quiche pan. Cover with plastic wrap, turning one edge back to vent. Microwave at High for 7 minutes. 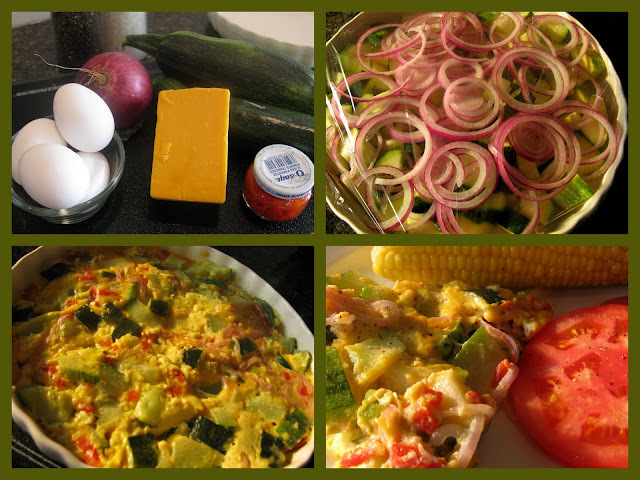 In large bowl, mix together eggs, cheese, pimiento, salt and pepper. Add zucchini and onions, stirring well. Grease dish in which veggies were cooked. Pour zucchini mixture into dish. Cover with parchment paper and microwave at medium-high for 5 minutes. Stir. Microwave uncovered for another 3-4 minutes at medium-high or until set. *I actually used the pimento called for in the recipe this time...but have used diced red, orange or yellow bell peppers instead...blanching them with the zucchini and onions. A dash of cayenne pepper adds a little zip as well. I call this oatmeal bread rustic because it never looks like a nice smooth loaf but that is alright, it tastes good anyway. I used to make this bread a lot but had veered away from it for awhile and was all caught up in making multigrain bread. This bread is also great for toasting..and even nicer if you have a jar of fresh raspberry jam sitting close by. This recipe is from Better Homes and Gardens Homemade Bread Cookbook. Combine boiling water, oats, molasses, shortening and salt. Set aside and cool to lukewarm. Once cooled stir in 2 cups flour and beat well. Add beaten eggs, 1/2 cup water, and combine. Add yeast which I just throw in with the remaining flour, using a cup of flour at a time until your dough comes together. Knead till smooth and elastic, 5 to 8 minutes. Cover and let rise in a warm place until double, 1 to 1 1/2 hrs. Punch down dough, divide in half and let rest for 10 minutes. Shape dough into loaves and roll in oats. Place in 2 greased bread pans. Cover and let rise until double and bake at 375º for 30 to 35 minutes. This dish is just perfect for your end-of-summer bumper crop of squash. Sure enough, I dashed out into my garden to find more Zucchini than I really wanted. I was talking to a colleague at work about my bumper crop and she shared this recipe with me. 1 jar (6 oz.) artichoke hearts packed in oil drained and chopped. 3/4 Tbsp freshly grated lemon zest or juice of 1 lemon. 6 zucchini (8-10 inches long about 1" in diameter,) halved lengthwise and seeded. In a large skillet over medium heat, brown the hamburger meat in olive oil. Transfer to a large bowl. Add vegetables, artichoke hearts and their oil, walnuts, herbs, lemon zest and juice, and salt and pepper. Toss to combine. Place zucchini halves cut side up in a 5-by-12 ovenproof baking dish. Mound mixture evenly into each zucchini "boat." Cover with aluminum foil and bake 30 minutes. Uncover and sprinkle with cheese. Bake 10 minutes more or until cheese is melted. I chose to grill the zucchini during the last 10 minutes instead, while the cheese melted, to give it that extra BBQ flavor. 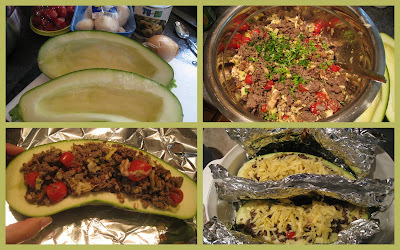 I doubled the meat proportion and made this dish for 4 servings and found I had plenty of left overs and so I just continued using the meat mixture and stuffing more zucchini and green peppers throughout the week. The meat mixture stays well preserved in the fridge for 5-7 days. I had unexpected company and I whipped up this dish, with some surprised expressions. Add a few skewers of fresh grilled vegetables and corn on the cob, and you will be guaranteed a tasty dinner. Perfect for any summer evening. We only have 3 weeks left of summer and let's enjoy it. This is a childhood favorite dessert. We used to have some kind of jello type dish at every family gathering and Sunday lunch. It is so simple to make and fits into a busy lifestyle, offering a light and refreshing dessert anytime of the year, especially in the summer when you don't feel like heating up the house. I hope you enjoy it too. I think that I can credit this to my mom or my mom's sisters. Who knows who started the tradition, it would be interesting to see how they remember it. So ladies who started it? Dissolve jello in the boiling water, stir well until it is all dissolved. Add 2 cups ice cream and stir until the ice cream is melted into the jello. Let sit in the refrigerator until set. Dig in and enjoy your company, even if you are your own company. The Mennonite Treasury of Recipes is a wonderful source of recipes that have been passed down through the generations. 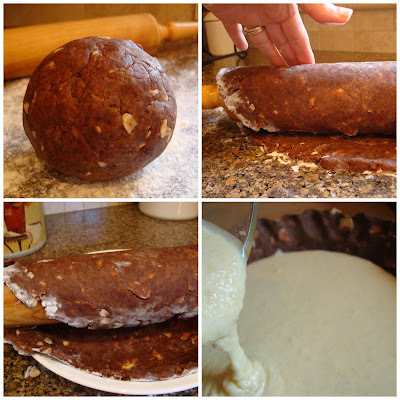 The inspiration for this refrigerator dough recipe came from Mrs. J. Rempel. Mix the boiling water, sugar, salt and shortening together in a large bowl and allow to cool. Soften yeast in the lukewarm water. Combine the yeast and the cooled shortening water mixture. Add the flour all at once and stir well. The dough should be stiff. Scrape into a large greased bowl and cover the dough with plastic wrap and refrigerate for two hours or until doubled in bulk. 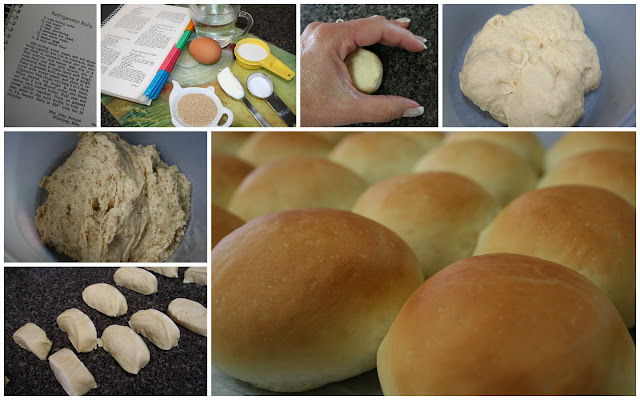 Punch the dough down and refrigerate again or make into rolls. Punch the dough down once a day and use the dough within a few days. If you are unsure how to form your dough into buns, make the dough into a long roll about 1 1/2 thick. Cut into slices and roll in the palm of your hand as shown in the picture. Roll quickly to make a nice smooth ball. Put the rolls onto a greased cookie sheet or a parchment lined sheet. Cover with clean teatowels. Allow to rise until they have doubled in size, up to 1 1/2 hours and then bake in a preheated 400 º oven, about 15 minutes. Fresh fruit salad is a summertime favorite...and the recipe for this cooked pineapple dressing has been a standard at our home for decades. It is from the Mennonite Treasury of Recipes, and can be stirred into the fruit salad or served separately as a topping for the fruit. Use fresh fruit of your choice...strawberries, pineapple, grapes, blueberries or peaches. Beat eggs; add sugar, pineapple and lemon juice. Cook in saucepan over medium heat, stirring constantly until thickened. Chill. Whip cream and fold into mixture just before serving. It was about 25 years ago my friend Irma and I went to her sister in law Janice's place, and she served us this most wonderful fresh fruit square. I have not made it for a few years, but today I had some fresh raspberries and this was the perfect way to put them to use. Of course the raspberry ripple cheesecake ice cream finished it off perfectly. In a small glass bowl dissolve sugar in the warm water. Sprinkle the yeast over and let proof for 10 minutes and then stir well. -2 1/2 cups flour, and using a pastry blender, cut in 1 cup butter. -4 eggs yolks until thick and creamy. Stir the yeast mixture and egg yolks together and pour over the flour mixture. Stir until the dough comes together in a soft smooth ball. If the dough is sticky add a small amount of flour. This dough is very easy to work with. Set aside while you get the berries ready. Stir these 3 ingredients together. 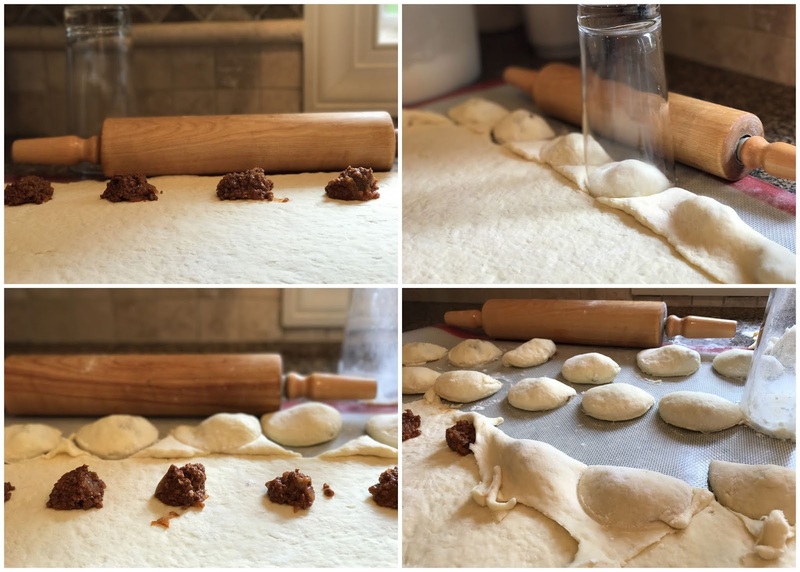 Divide the dough into two equal pieces. On a lightly floured counter roll out one piece to fit a cookie sheet. (I use a small sheet that is 10x14, but a larger one will work fine). Make sure the dough comes up the sides of the pan. Pour the prepared berries over the base crust. Roll the second piece of dough and place over the berries. Using a fork press the edges down all the way around the pan. Make small air whole slits over the top crust. Cover loosely with Saran and let rise on counter for 40 minutes. Bake in 375º oven for 40 minutes. Allow squares to cool and then ice. Stir together until you get a smooth icing that is a little thin so it spreads easy and glazes the squares. If you make this after the berry season has finished just pull out your frozen fruit and allow to thaw. You will need to add another heaping tablespoon of cornstarch if you use frozen berries. I drain the juice from the thawed berries, add the cornstarch and sugar to the juice and heat in the microwave for 3 minutes stirring half way through. Then I pour that hot mixture over the berries and let it all cool. Once it has cooled, continue the same as for fresh berries. I have made a bumble berry mixture from my freezer using a mix of strawberries, raspberries, blueberries and blackberries. I was inspired by a recipe I found in a little recipe book called PIES, published in the UK. By the time I finished with my version, I could not really say that it was the same recipe, but the model is there. With the peaches on our tree reminding me that this is the season, I thought it was a good time to take a photo. Cut in the butter with pastry blender just to make it crumbly. Sprinkle with water and almond extract, then stir with fork until it holds together and you can shape it into a ball. Sprinkle rolling surface with flour. Flatten dough with hands and shape into a circle. Sprinkle with flour and roll into circular shape, flipping once and adding a little flour as needed. Roll up with rolling pin and unroll into pie plate. This pastry may be fragile, but you can patch it up. Flute edges as desired. Preheat oven to 350º F. Put an empty baking sheet on middle oven rack. Process the almonds in a food processor or blender. Add sugar, butter, eggs and almond extract, processing until smooth. Pour or spoon into prepared pie plate. Cover with one layer of thick slices of pealed or canned peaches, spreading out slightly like spokes on a wheel. 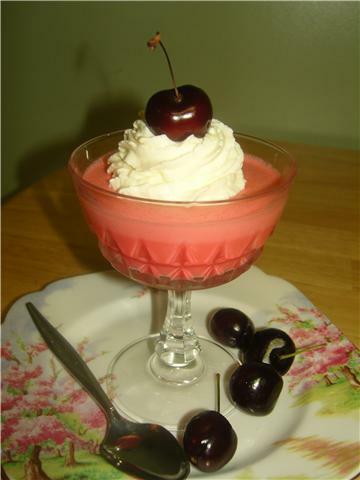 Serve warm or cooled with whipped cream. I found this recipe in the food section of the news paper. It makes a really nice addition to any brunch or coffee and dessert evening with friends. 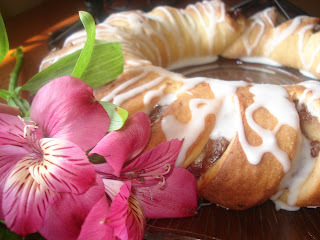 The filling is sour cherry that makes this a special treat and just a bit different from a traditional cinnamon loaf. Combine 1 1/4 cup flour, sugar, dry yeast and salt. Heat milk water and butter til very warm and butter is melted. Gradually add to dry ingredients. Beat 2 minutes, scraping bowl. Add egg and 1/2 cup flour. Beat 2 more minutes, adding enough flour to make stiff batter. Cover with greased plastic wrap and refrigerate for 2-24 hours. Roll each half into a 18x10 in rectangle. Spread with cherry filling to 1/2" from the edge. Roll up and pinch to seal, make a ring. Cut in 1" intervals 2/3 through. Twist each section sideways. Cover till double about 1 hour. Combine and drizzle over slightly warm bread. This is a very simple dessert to make with very little fuss for a birthday or any other special occasion. I made it for my son's birthday party and everyone loved it. The pan came home empty. In a 9 x 13 x 2 inch pan, layer 12 ice cream bars, then a layer of whipped cream, another layer of 12 ice cream bars and another layer of whipped cream. Sprinkle top with bits of chocolate shavings. Place in freezer and allow to freeze for a few hours, till the whipped cream is frozen. Keep frozen until time to serve it. On this Rock I Stand.. I was reminded of this verse a few weeks ago when I stood on this rock that you see in this photo. I thought of how large and solid it was..but nothing compared to the solid rock that Christ is. In summer.we are always looking for ways to simplify so I regularly put a few extra chicken breasts on the grill when I prepare grilled chicken. I also enjoy changing the additions to the salad. For summer we use fresh fruits and in winter we use canned and dried. Both are excellent I'm offering a few variations to this salad today. 2 cups of cooked (according to package directions) pasta of your choice. (I used rotini with the fibre that no one sees.) Pasta is optional but makes it more of a meal. Combine the dressing ingredients in a small container with a lid. . .so you can give it a good shake. To your drained pasta. . add half the dressing and allow to chill in the refrigerator for several hours or even overnight. Just before serving, toss the pasta with the romaine, spinach and onion. Add enough dressing to coat .. not too heavy .. don't add it all at once. Just before serving. . .plate your salad. Divide the greens and pasta between your dishes. Add the sliced chicken, and then the rest of the goodies. . . This is my mom by love Pauline. If I could. . .and if it were kind. . 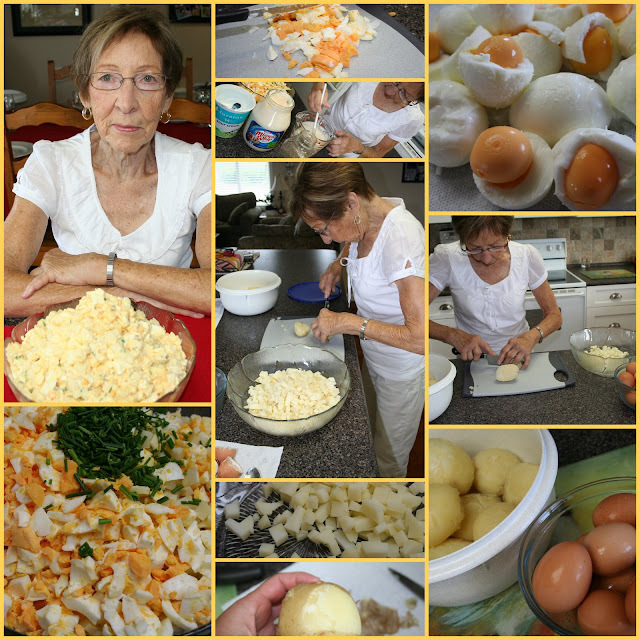 I'd rent her out for potato salad making lessons. . .but I can't and it wouldn't be nice. . and so at long last. . .here is her not so secret recipe. I have been told by my own sons. . ."Grandma's potato Salad is the best". They are quite correct. When we have family gatherings. . .she is more often than not given the task of the potato salad. I recently invited her over. I had the potatoes and eggs cooked and she put it together while I did the photo shoot. 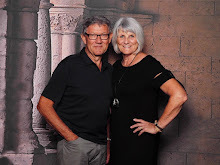 Please give our guest blogger Pauline a warm welcome. The day ahead. . .boil your potatoes in a pot with a few teaspoons of salt. Leave the skins on. . .this is important. Boil for about 20 minutes and then test with a knife to see if they are done. ..if not. . leave a few more minutes. Drain. . and then cool for about 1/2 hour. Once cool enough to handle. . . use a sharp knife to grab a edge of peel and peel all the potatoes. Do not chill first. . .peel them while still warm. Refrigerate until chilled. Now. . .using a sharp paring knife. . and a chef knife. . set each chilled potato on a cutting board slice it in half. . .then with the paring knife. . cut each potato length wise into 1/3 inch strips. .and then cube by cutting in the opposite direction. The uniform cubes of potatoes makes this salad so enjoyable. When the potatoes are cut by me in a hurry .. and not uniformed.. . my boys know I made it. . . .and the praise is scarce. Add the chopped chives to the bowl. In a medium bowl. .combine the Miracle Whip Salad Dressing and the Sour cream. . with the salt and pepper. Pour half of it over the salad. . and stir all together. . .add a little more dressing at a time. You may need more or less depending on the size of your potatoes. 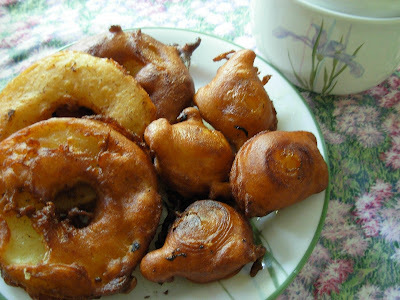 We love fruit fritters ....and these really taste just as good as the wheat flour ones. Add fruit and deep fry. For apples , I core the apples then cut them in slices, dipping the apples into the batter then frying. For the little yellow plums I dipped each singly into the batter before frying. Larger fruit can be cut into pieces and stirred into batter and fried like pancakes. Serve hot with sugar !! On a recent road trip, we stopped off at an ABC restaurant where I had my first pulled pork sandwich. I loved it! On the same weekend, I found a recipe in the July issue of Woman’s World, called Carolina Pulled Pork sandwiches. I’ve changed it up a bit, but however you make it, you won’t be disappointed. It is a perfect no ‘fuss meal’ to serve for a larger group. Place onion and garlic in bottom of 3-qt slow cooker. Top with pork. Sprinkle with seasoning. In a small bowl, whisk together ketchup, sugar, cornstarch, vinegar and salt, until smooth. Transfer pork to a plate, reserving sauce in slow cooker. Skim off oil/fat coming to the top. Cool pork slightly. Using two forks, shred pork into bite sized pieces. Return to slow cooker, mixing with sauce. Stir in 1/4 - 1/2 cup BBQ sauce, according to taste, if desired. Keep warm to serve. If serving the next day, refrigerate and reheat in roaster or other ovenproof dish. Serving suggestion: Serve on large buns with coleslaw and baked beans. It's been one more hot day in the Fraser Valley. Record breaking temperatures. The only thing that I can think of making is a fresh salad with all our garden vegetables. This has been one of my favorite's this summer. It's simple, quick and has a kick to it and will be one of the first salads on the guys list. They all love bacon. This comes from the kitchen of Steff, a younger friend of mine who's always trying something new. If I need a quick appetizer, I can count on her and now I have a good collection of recipes/appetizers on hand. Prepare the lettuces together in a bowl and add the remaining ingredient on top. Toss the last two ingredients together and toss on top just before serving. I pour the dressing over and then mix it up slightly. I love the colorful display, so I don't mix to much, rather let it soak through the leaves. Mix together and pour just before serving. Make it ahead of time and take it along to the beach. Hospitality was taught by example in most Mennonite homes. Friends, family and neighbours knew they were welcome at any time and it was not unusual to invite strangers for a meal – the farm hands, salesmen, a family in need. The Bible urges each person to show hospitality to those around them and to do it generously and without complaining. Hospitality is also listed as one of the spiritual gifts especially given to some individuals. So many think that hospitality requires a specially set table and a fancy meal. However in our busy lives, most of us don’t have the time or inclination to do this. The hospitality the Bible speaks of merely requires that we willingly share what we have with others. And don’t forget to extend that same hospitality to your children, your parents, and yes, even to yourself. In doing so you are a living example of the grace God has extended to you. I love bell peppers, any colour - raw, roasted, saute'ed, pickled or grilled. This pepper relish will make hot dogs and hamburgers a gourmet treat. It's also good served on sandwiches or alongside meatloaf and ham. where they sell them by the bag full for a very reasonable price. Cut peppers open, remove seeds and membranes and slice thinly into 1 ½ inch pieces. Peel and slice onions into 1 1/2 inch pieces. You should have about 32 cups prepared vegetables. Mix peppers and onions in a large bowl. Add coarse salt and toss well. Let mixture sit for 2 hours. Drain and rinse well and place vegetables in a large stock pot. Mix dry ingredients together and stir into vegetables. Add vinegar and water to vegetables in pot and mix well. Bring to a boil and cook on medium high heat for about 10 minutes or just until vegetables are tender. Mix cornstarch and water and stir into vegetable mixture. Bring to a boil. Bring snap tops to a boil in a small pot. Ladle pepper relish into sterilized jars and wipe top edge of jar before topping with a hot snap top. Add ring - screw it on firmly but do not tighten. Bring water to boil in canner. Water should cover jars. Immerse jars in hot water, bring to a boil and process for about 4 minutes. Remove from canner and cool.